Xanthelasma is a condition associated with yellow patches of skin near the internal corner of the eye and the upper eyelid caused by cholesterol deposits. Although these discolourations are not harmful, they could be indicative of the presence of high cholesterol in the blood. Xanthelasma is linked to high cholesterol or even heart disease. It is also interesting to note that this condition has a higher prevalence within Asian and Mediterranean cultures. Obesity and smoking may also be contributing factors. While these areas are painless, they will normally not resolve themselves without some form of clinical treatment. 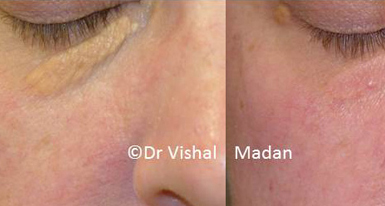 The good news is that UK Dermatologist provides a number of effective Xanthelasma treatment options. Let us look at your choices in more detail. Xanthelasma removal can involve a number of discrete steps. The exact course of action will be determined after you consult with one of our practitioners. • Surgical excision, especially if there is good eyelid laxity. • Topical medicines which can help to dissolve the cholesterol patches over time. In the majority of cases, none of these treatment options will leave a discernible scar. However, there may be some instances when pale scarring is present. It is just as important to mention that some side effects from this type of intervention can occur on occasion. These may include scarring, pale skin or recurrence of xanthelasma. This is particularly the case if you suffer from high cholesterol or your family has a history of heart disease. In such situations, the procedures may need to be performed again. It is always wise to speak with one of our trained specialists in order to determine the best course of action in advance. Would you like to learn more about Xanthelasma Removal or are you hoping to schedule a consultation? If so, please do not hesitate to book an appointment at your convenience.